1 – “I can add that easily at a later time.” “(My client) insisted that she didn’t need a microwave, but when her husband was transferred and they had to sell their home, the missing microwave (or dedicated space to place one) was a big issue among potential buyers. …even those who admired her kitchen cabinetry.” Designers agree that it’s best to add features to your new kitchen during, not after, renovation. Even if you’re not sure whether you’ll use a feature right away, prepare for its future installation by running cable and electrical lines. For example, one day, you, your growing kids, or a future homeowner may want a flat-screen television or a home-monitoring screen in the kitchen. 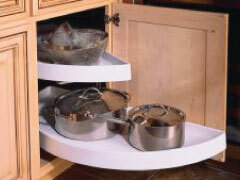 Or you may someday need more outlets on your counters and island. Homeowners should install a variety of kitchen lighting fixtures throughout the kitchen, especially under-cabinet lighting, since it illuminates counter top space far better than overhead lighting alone. Also, don’t forget to consider aging issues. 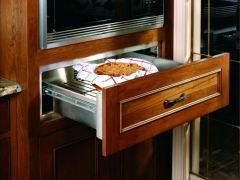 Wall ovens and drawer-style dishwashers will prove a plus if you develop back problems down the road. Whether we like it or not, life is messy–in kitchens, both new and old. 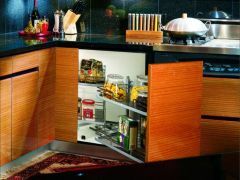 That’s why adequate space to store your food stuff, is essential. The most common mistake among homeowners is that they recreate kitchens that open into other rooms without planning for upper storage for china and glassware. There has to be a proper balance between function and style. 3 – “Bigger is always better.”Like so many homeowners, Ms. X finally got a tremendous kitchen for entertaining, but now she walks endlessly from one appliance to another. This is another mistake that homeowners wind up having to live with for a long time, since kitchen renovations are done only once every 15 years or so. The solution is to install two sets of appliances, essentially integrating two work triangles into the kitchen area. Most designers urge their clients to choose quality over quantity when designing a kitchen, particularly if money is an issue. It’s quite possible to entertain up to 40 people “without trauma” in a smaller, efficient kitchen. 4 – “I don’t need a designer.” Ms. X put her builder in charge of renovating the kitchen of her old house. Unfortunately, the builder failed to inspect above the ceiling prior to starting work. Eventually, Ms. X had to hire a designer to help deal with the oven hood protruding from her ceiling molding, visible duct work and a mishmash of cabinets of different sizes. A year later, the project still isn’t complete. Not every kitchen project requires a designer. But many of us need someone to help us see the big picture and oversee the entire project, including working within budget and coordinating the efforts of the architect and builder or contractor. That’s part of the CST Kitchen’s advantage. 5 – “Grow attached to what’s familiar.”Don’t insist on putting in a new island if there clearly isn’t room for it. Human nature is tricky. We can unwittingly grow attached to our old appliances and end up with new refrigerators that are too small or with ovens that are short on burners. Or, we forget our physical limitations and opt for a sink bay window that’s too deep or an island that’s too large to clean. If there’s too little space, you’re trapped when someone lowers the door of the oven, dishwasher or microwave! 6 – “I want what she has.” It’s always tempting to follow the latest trends. But it pays to be practical. Will that funky kitchen, featured in that glossy magazine, really work in your house? Considering the scope of a kitchen renovation, it’s best to proceed prudently. Homeowners get carried away when they see in someone else’s kitchen. Don’t go bounding off and buy components and accessories without thinking of the rest of the house. The kitchen is usually the first room you address during a home renovation, and it dictates the colors for the rest of the house–for a time that seems like an eternity. It’s a tremendous investment. Plan carefully.